I have Ina Garten to thank for many foodie things in my life: a collection of her cookbooks that I use again and again, an appreciation for the simple truth that less honestly is more when it comes to good food, the courage to cook with new ingredients because she makes it look so easy, and (most importantly for my daily life) my favorite go-to dinner recipe—Summer Garden Pasta. You should buy this if you don’t already have it. 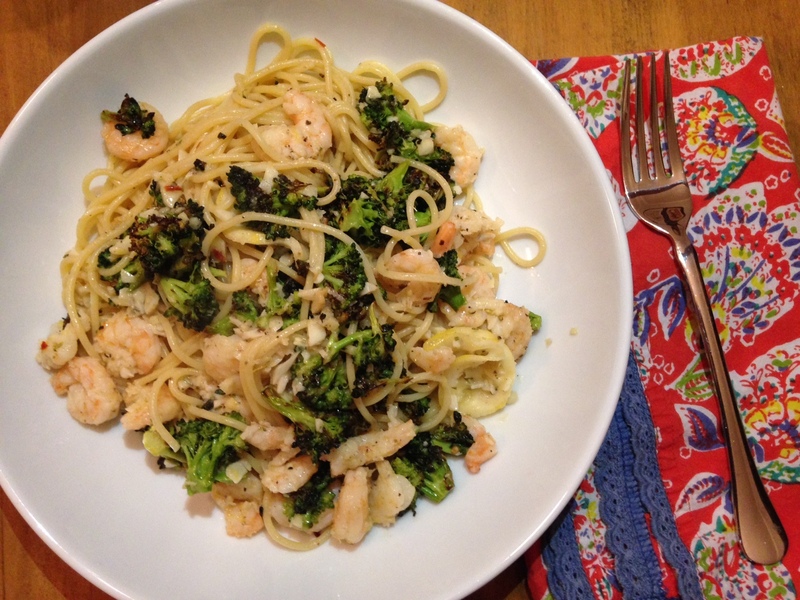 We all have that one easy dish we rely on, right? This recipe from her Barefoot Contessa At Home cookbook is so simple and satisfying, and the ingredients are things I keep on hand. You remember garlic, my first love. This stuff is the BEST. Just put it in a glass of water on your window sill and it will last for weeks. These are delish in all kinds of dishes. Keep them around. You’ll be glad you did. 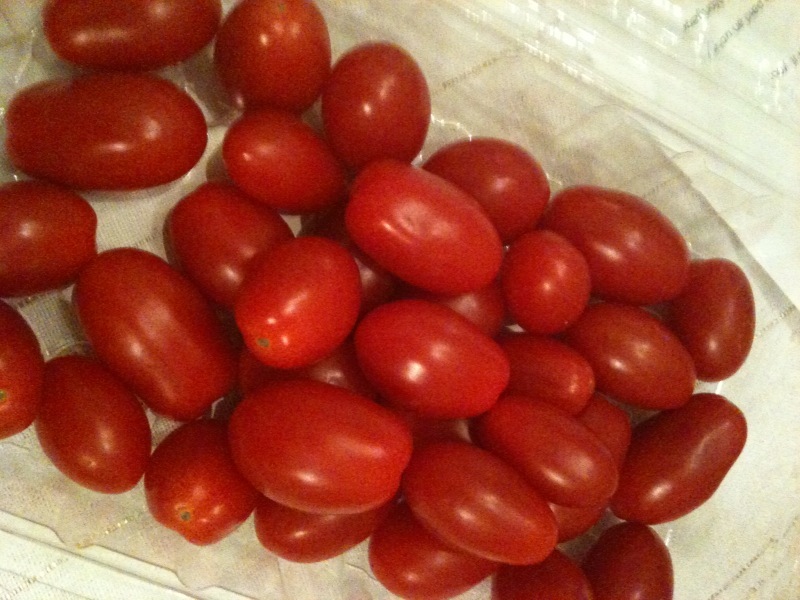 Combine the tomatoes, olive oil, garlic, basil, red pepper flakes, salt, and pepper in a bowl. Cover with plastic wrap, and set aside at room temperature. Ina says to let this sit for about 4 hours (at least 2 ½ hours), but sometimes I just don’t have time for that. 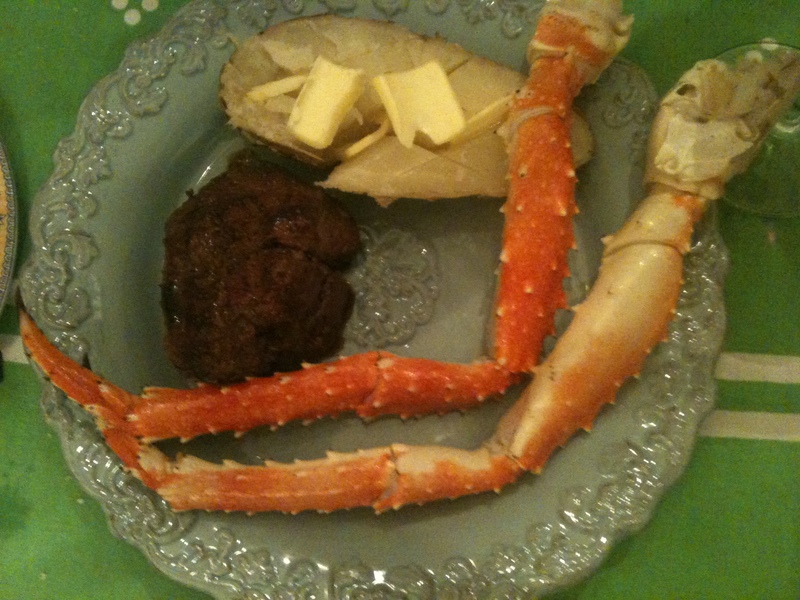 The longer it sits, the better; however, I have thrown it all together in 20 minutes and it still tasted good to me. Just before you’re ready to eat, cook the pasta in boiling salted water until al dente. 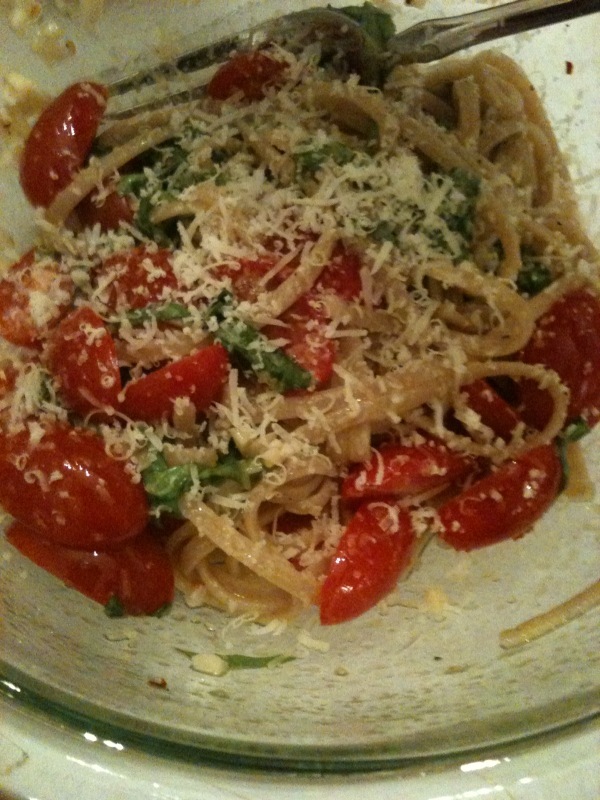 Drain the pasta and add to the bowl with the cherry tomatoes. Add the cheese and some extra basil, and toss well. I may or may not have sprinkled more cheese on top after I snapped this picture. Categories: Cookbooks, Recipes | Tags: cherry tomato pasta dish, cookbooks, garlic, go to dinner, ina garten, live basil | Permalink. Luckily for me, a Home Depot hot dog was not the culinary highlight of last weekend. This menu included boiled crab legs with drawn butter, grilled filets, baked potato, grilled artichokes, and rosemary roasted garlic purée with crusty bread. The occasion? Saturday. 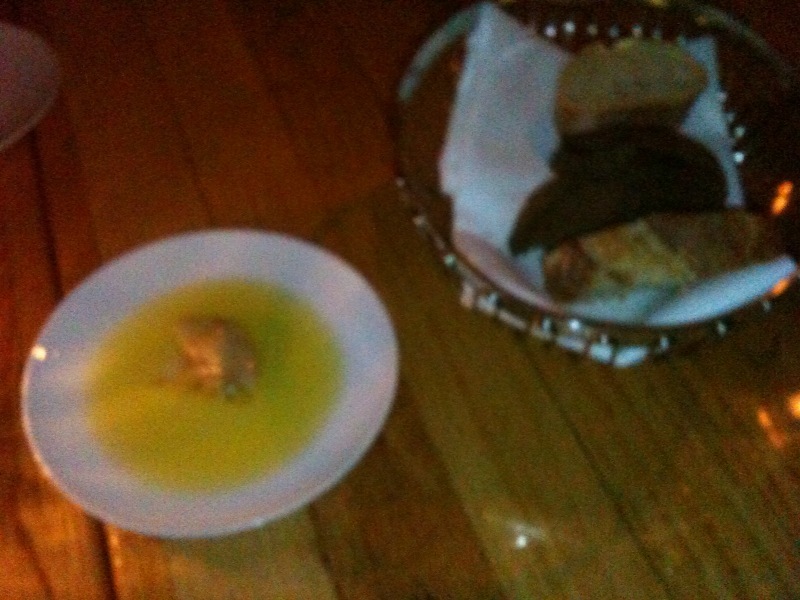 I vowed to figure out this garlicky deliciousness after dinner at Fluke in RI. And I must say, I think I’ve mastered it. Preheat oven to 400 degrees. Leaving the skin on, trim off the top of each head of garlic, exposing each clove. Drizzle with olive oil and rub in. You want to be sure each clove has a little oil. 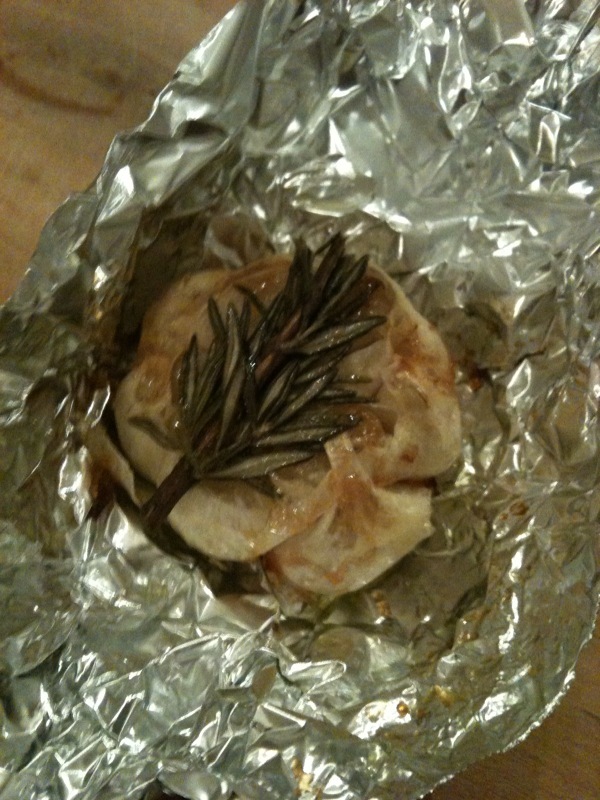 Place one sprig of rosemary on top of each head and wrap with foil. Bake for 45 minutes to an hour, until the cloves are very soft. Using a spatula, remove the garlic to a plate. 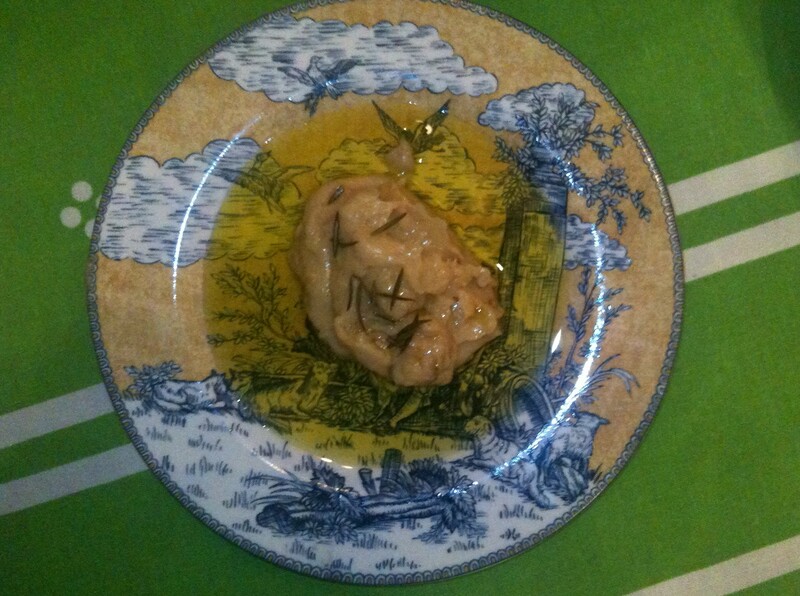 Pour olive oil around the mound of goodness, and sprinkle with a few rosemary leaves. Serve with warm, crusty bread. Oh yes. This is living. 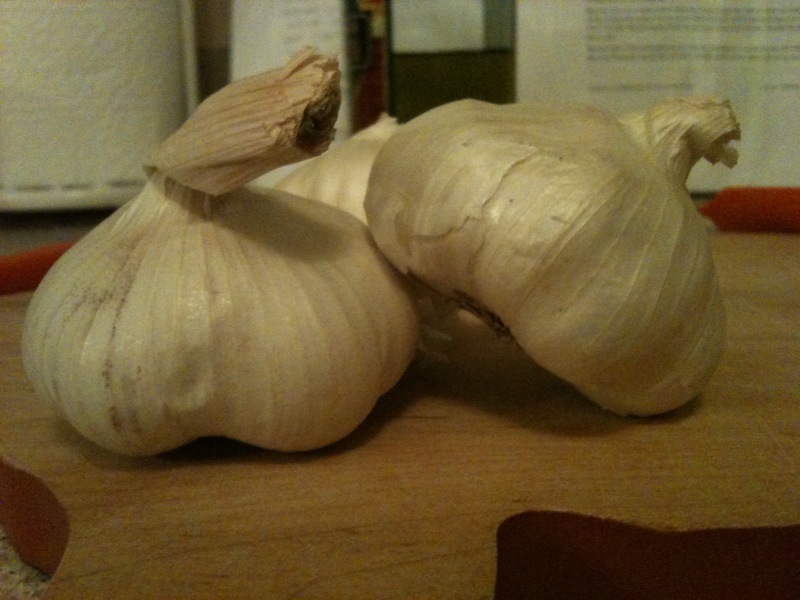 Try infusing the garlic with a different herb. How bad could sage garlic be? 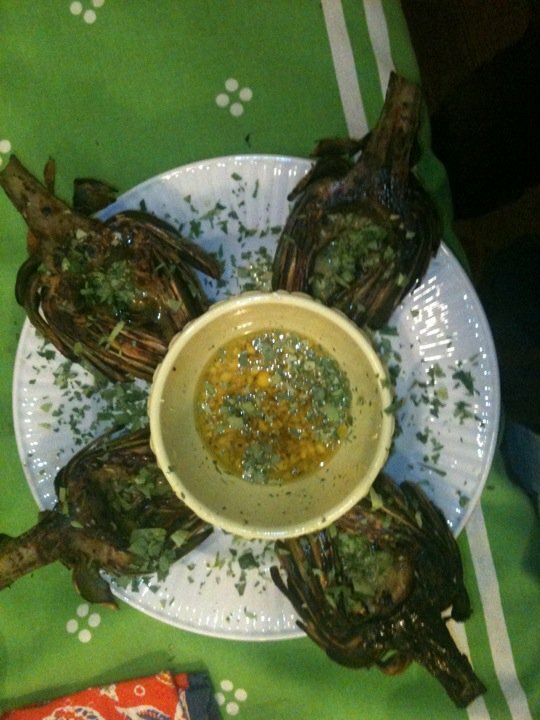 Categories: Recipes | Tags: artichokes, garlic, rosemary garlic puree | Permalink. 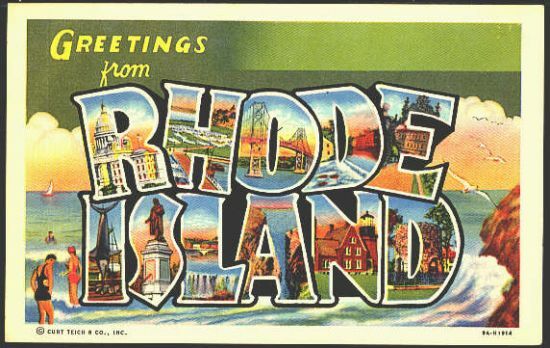 Don’t let the tinniness of Rhode Island fool you—New Englanders have managed to pack a multitude of flavorful restaurants into a square footage the size of the county I grew up in. I took a long weekend trip to The Ocean State to visit Kristen & Anne Marie, and we had many amazing culinary adventures along the way. 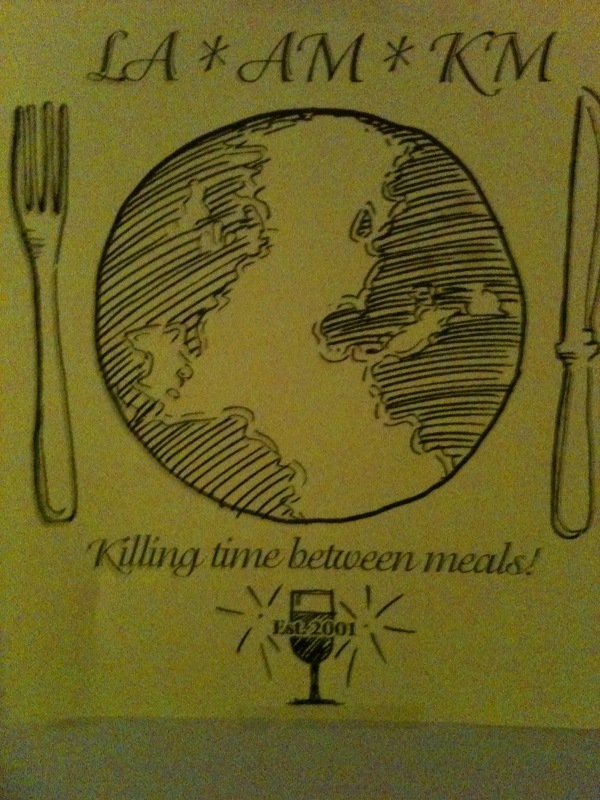 AM even had these cute signs drawn up for the event. Our first night’s dinner was shared in Providence at Al Forno, which we had planned on visiting solely based on the lavender panna cotta. Unfortunately, said dessert wasn’t available that night, but I managed to stay happy between homemade grilled pizza, linguine with creamy egg & duck bacon, and the three desserts we ordered for the table to split. It was a grand dinner, to say the least, and I can’t wait to go back. The second day we headed to Newport—the quintessential city-by-the-sea. On our way to lunch we randomly saw a restaurant AM had told us about, so we stopped and made dinner reservations. (I mean, this is the original killing time between meals crew—would you expect anything less?) Anyway, New England is famous for chowder, pronounced “chowdah” up there, so we headed to The Black Pearl to sample the city’s finest. Hands down, the best I have ever eaten. Not too many potatoes. Lots of clams. 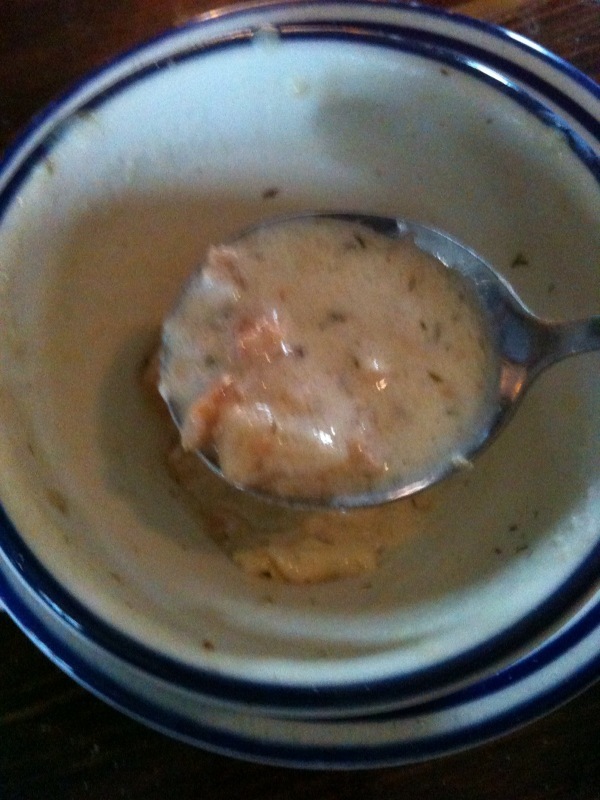 Thick, creamy, goodness potent with dill. It was bowl-lickable. The best news? You can buy it by the case here. 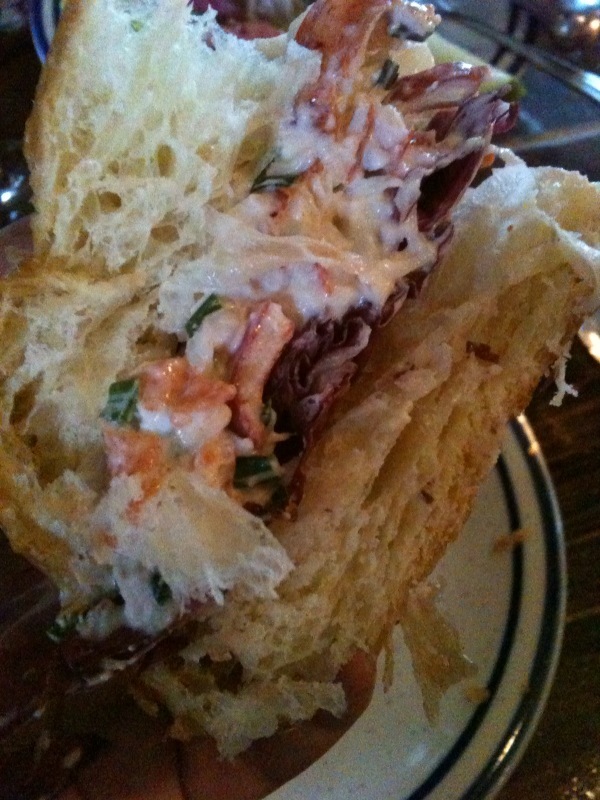 Kristen and I then shared a lobster salad on croissant. I don’t usually care for lobster (I find the meat too tough, so I’d rather eat crab), but as a salad, it was delectable. I would add a photo of us dining at The Black Pearl, but AM is our resident photographer, and I only took pictures of food. A few hours later we (minus Kristen, who wasn’t feeling well) headed to Fluke for dinner. Let me just start by saying that I would get arrested to eat this meal again. 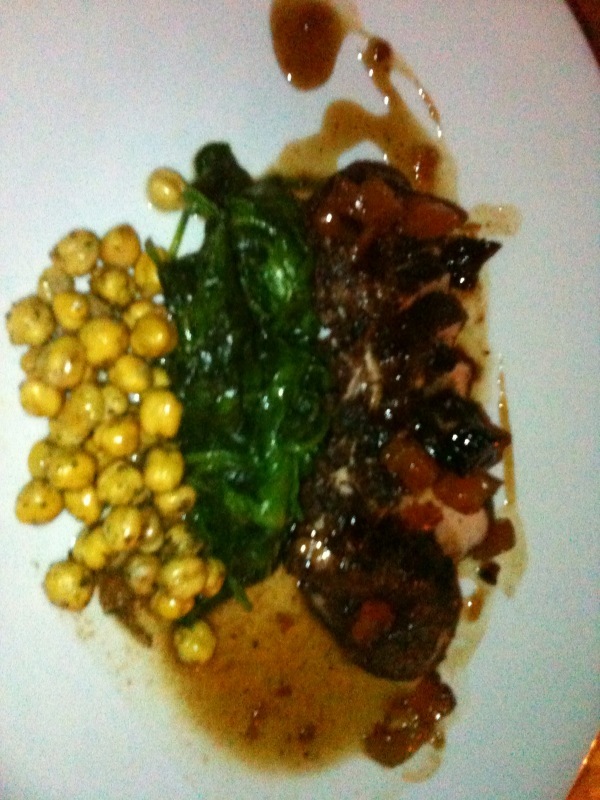 After an extra order of that garlic and fire roasted octopus, I moved on to a grilled pork tenderloin. It was cooked to perfection, which I’m pretty sure wasn’t a stroke of good luck as the restaurant’s name suggests. As a matter of fact, Fluke’s chef Neil Manacle worked as Bobby Flay’s sous chef on Iron Chef America and in many of Flay’s New York restaurants. 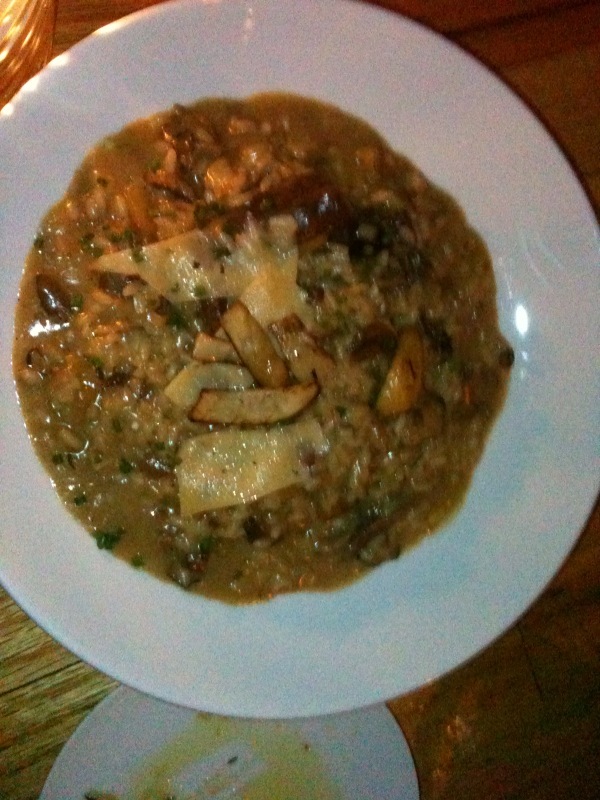 We also ordered the wild mushroom risotto with truffle oil for the table to share. Another successful, delicious trip to RI! And wouldn’t you know, we’ve already started planning the restaurant tour on my next visit. Categories: Friends, Restaurants | Tags: al forno, arrested, chowder, fluke, garlic, kristen & anne marie, rhode island, the black pearl | Permalink.